Listen every week, favorite wrestling podcast. Iâm a casual wrestling fan and I LOVE this show for both the excellent discussion and analysis as well as the laughs! My favorite is Scott, but Dale and Jonny are great too. Especially love their coverage of womenâs wrestling. Give it a listen you wonât be disappointed! Iâve been watching wrestling for like 20 years and this is one of the 2 best wrestling podcasts Iâve ever listened too! If you like wrestling and people talking about it this is definitely your show. Something different from the norm. Sometimes you come across something very special. If you're a fan of pro-wrestling, most podcasts available for us to listen to are pretty mundane. Take a "legend", and sit him/her down, so he/she can complain about the product today, and how things were so much better WAY back then. Podcasts like these become very old,very quick. That is why I urge you to listen to the "Wrestling Compadres" Slamcast. This podcast gives vibrancy to pro-wrestling podcasts, in an otherwise humdrum collection of podcasts that don't really differentiate each other. The podcast has a positive vibe with lots of humor and sarcasm to boot. Each week the show flies by as you hear reviews of the latest shows, pro-wrestling news interviews and so much more. Oh and the crew that make-up the podcast are going to be BIG in the near future. They all are extremely talented and have their own projects that I also love to support. If you're a fan of pro-wrestling this is the podcast for you. They obviously love wrestling and enjoy hanging out together! I love their analysis and seeing how they interpret the product each week. Love these guys to pieces. Even if I miss wrestling this week, I make a point to check in with the Compadres, because they always keep me stoked to get back into it. Great chemistry, great conversations, and genuine love of the craft. This podcast is great these guys know their wrestling. Been listening for years now I feel like they are my good friends. Lots of laughs and knowledge. This show is pretty awesome! Scott Narver is my fave. Iâve been following him since âCurtain Jerksâ podcast (check it out!). The rest of the team are very cool too. My favorite group of wrestling reviewers. This would be one of the best wrestling podcasts there is if if wasnt for Jay Washington. Jay is super annoying. Every show he's on is cringeworthy. Other than that I would give 5 stars. Less Jay. More Jake. Nothing is better than listening to the crew set Jay off into a fit of giggles. Incredibly insightful and hilarious content week after week! Entertaining and informative. Always recommended to friends! Havenât been able to rate/review/subscribe due to not having iTunes but these guys now get my 5*s and are must listen every week. Thanks to Jonny and the team for weekly awesomeness. First time Iâve ever listened to this podcast and I think itâs going to be apart of my weekly podcasts I listen! Thanks guys and keep it up. You just gained yourself another listener. Iâve been listening to the show for a while now and this is still my favorite podcast! Love the coverage and the interviews! Keep up the great work guys. Compadre for life! I used to love this podcast. But the quality has been taking a nosedive. Dead air. Missing audio. Producers throwing a fit. Today it sounded like they were playing sound bites but they were barely being picked up on mic. And the addition of Jay Washington is unbearable. I stopped listening to Raw Afterbuzz because of him. Now he's here!? Can't do it anymore, guys. Yes! Yes! Freaking hell yes! This podcast is for that inner child in you that can't get enough wrestling! You can tell that the hosts really enjoy and have that passion for all things wrestling. If you are into wrestling then you should listen to this podcast. You guys are awesome. I'm almost positive I'm your most loyal fan. Listen to you guys religiously. The most personality on any wrestling podcast and that's why I love you guys. Don't ever stop making these. I don't care if you get better jobs lol and more Carrlyn! Best In The World At What They Do! I've been listening to this podcast for about a year and a half, and I love it! This current lineup is my favorite. They love the art of wrestling and they're so passionate it. Thank you for entertaining me every week!! Fantastic interviews with the top talent in the industry combined with humorous insights, above and beyond the best wrestling news podcast I've listened to. If I don't laugh at least once per episode, it's because my earbuds fell out during the joke. It is totally worth it to go back through the catalog like I did when discovered it, if just for the soundboard alone. I miss the soundboard. Bring it back! I really enjoyed the Elimination Chamber podcast. keep up the great work. Can you smell what they are cooking? The first time I heard this podcast was just right before they made the move to Fox Sports and the very first episode I listened to was when Carrlyn Bathe guest stared. I was hooked ever since. I knew Jonny from listen to several other podcast (DC movie news and Raw after show) so it was a no brainier for me to tune in every week. Scott is hilarious and Dale is very insightful. But all of them know exactly what they are talking about when it comes to pro wrestling. But the best part is they embrace the power of positivity. They hold down that P.O.P and that is something not too many wrestling podcast, or even fans for that matter, have. They were singing the praises of Impact before anyone started to pay attention to that organization. They talk about anything big happening in wrestling. Don't worry WWE fans, they still have a focus on that company, but it is refreshing to hear about other promotions. 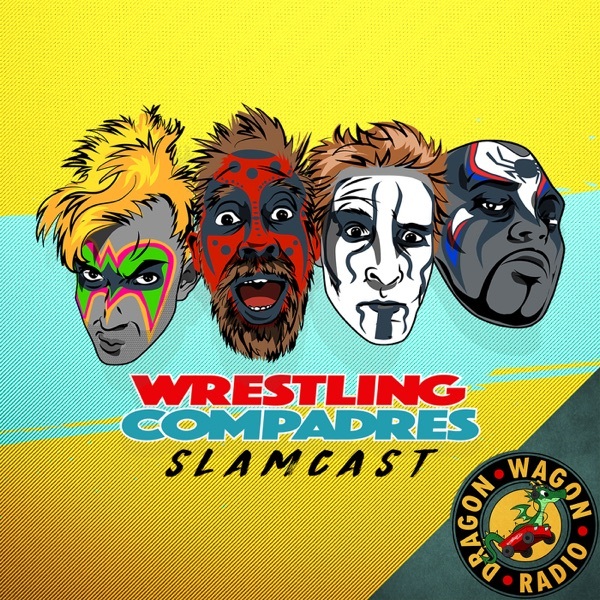 If you are a fan of pro wrestling and want to listen to a fair, insightful, positive and just all around good ol' fun, then the Compadres Wrestling Slamcast is definitely for you. I'm so glad I found this show, it's an absolute must. Download and consider yourself lucky! Sorry y'all. This show isn't good. RIP Chuck Rice. I tried to listen to this podcast and I couldn't even get through the first 5 minutes. It reminds me of a morning zoo type radio show. Way too much going on and everyone trying to speak at the same time. I'll stick with The Masked Man Show on the Channel 33 podcast or Cheap Heat. The whole Compadres Crew is BEST FOR BUSINESS. The wrestling compadres slamcast is at the crossroads of comedy and wrestling and is always an enjoyable listen. You have to make this a part of your regular rotation! A treat for all wrestling fans! A compadre from the Middle East!! I met Jonny while he was on a tour for our troops with some of my favorite wrestlers and now I'm hooked on this show. Most entertaining wrestling show out there, kudos to FOX Sports for picking it up!! These guys are hilarious, and down to earth. They have so many wrestling jokes, and use so many enhancements from RAW, SmackDown, and the Paper Views that it is impossible not to enjoy it. The interviews are great aswell. The wrestling compadres are a must listen to. Bah Gawd! A slobberknocker of a podcast! Absolutely wonderfully done wrestling podcast. Perfectly timed wrestling sound clips throughout the show add to the hilarity and awesomeness. Great hosts, great guests, great interviews, great references, great pod. Put if you want anything of value? This isn't it! Lose the 10 yr old giggle girl! And maybe you'd get a 3 star review? They're on FOX Sports?? Subscribe already!! Jonny, Dale, Carrlyn, and Scott are the most entertaining hosts of any wrestling podcast out there. Their passion for professional wrestling, regardless of whether it is WWE, Impact Wrestling, or indie promotions shows through each and every episode. They have a great relationship with professional wrestlers from many promotions and frequently have them on as guests. Oh, and make sure you download the FiteTV app so you know what the heck they're talking about when they discuss Championship Wrestling from Hollywood! This show is a excellent show to get your wrestling info and hear interviews with your favorite superstars just being real. A great show with an entertaining and knowledgeable cast. If I need to explain why than you obviously haven't experienced this podcast for yourself yet. I liked it, it was better than Cats, I will download it again and again. The humor, wit and commentary of this show has no equal. Excellent interviews, lively discussion along with amazing insight provides something for every fan of sports entertainment! If you're a fan of pro wrestling and great comedy, you need to download this podcast! This hosts are amazing, the content is unmatched, the guests are amazing...it's just an all around amazing show! Used to be a fan. Chuck being dropped like a bad habit killed the show for me. Best of luck. In lieu of recent news that Wrestling Compadres will be joining Fox Sports 1 this coming June 28th (check your local listings) Jonny and the crew have been delivering the most entertaining and enjoyable podcast on everything wrestling for over two years now. The show covers all the happenings in the noteworthy promotions (your WWEs, TNAs, Luchas Undergrounds, etc.) as well as has some of the most acclaimed names from the squared circle. Unlike other podcasts that at times can come off as cynical and look at me bookings, the Wrestling Compadres never take themselves or their show too seriously. To quote the ever eloquent and prophetic Dean "Lunatic Fringe" Ambrose, "... wrestlers are running around in our underwear and wrestling is just supposed to be fun." and the Wrestling Compadres Slamcast is indeed that. FS1 you have made a smart investment in these buddies, NOW CAN YOU DIG THAT!?! Weekly show. Covers all the big promotions and the current news and tumors. Usually 1.5 to 2 hours long. Four main hosts that are passionate and involved in the business. They give honest criticism with a good mix of some negativity and positivity. Good interviews and guests from the wrestling business.